Today I want to write about a really awesome butterfly called Queen Alexandra’s birdwing that grows bigger than I thought butterflies could grow. These beautiful butterflies have a wingspan of 28 cm, making them the largest butterflies in the world. The males are brightly coloured, with blue-green streaks and yellow spots on their black wings. Females are a much duller brown with yellow tips. The males and females both have a very bright yellow body. The caterpillars are also colourful. They are dark red, with bright reds spikes and two bright yellow spikes on their back. Queen Alexandra’s birdwing is totally reliant on a species of vine called aristolochia schlechteri. The female lays her eggs underneath the leaves. Then the caterpillar eats the leaves which gives them a toxin that is poisonous for predators. The adult then feeds on the flowers of the vine. They were named after Queen Alexandra, the Danish wife of King Edward VII of England. These beautiful butterflies only live in a small area of Papua New Guinea. Their habitat is under threat, but there are efforts to save their forests and save these amazing butterflies. 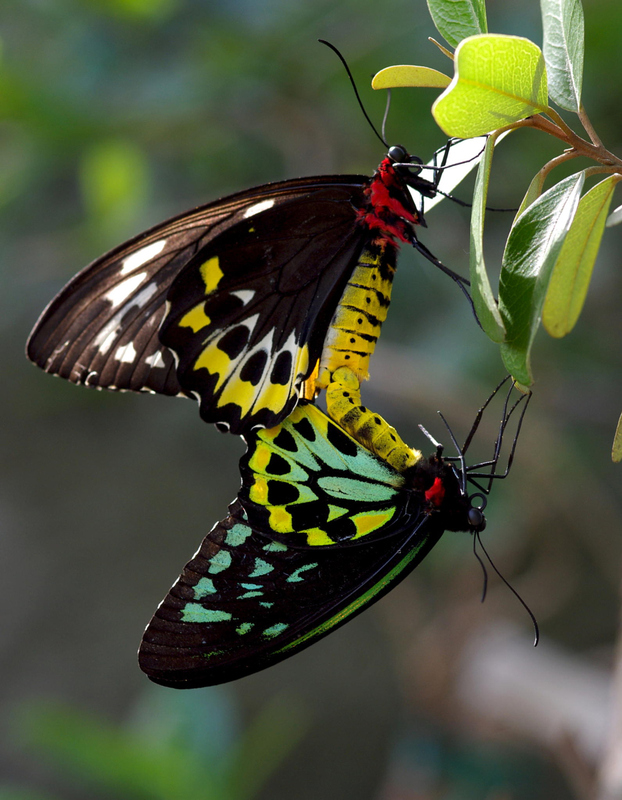 Are there any other interesting facts that you would like to share about Queen Alexandra’s birdwing? Its very unfortunate, but here is another website showing a picture of a supposed male Ornithoptera alexandrae but which is in fact Ornithoptera priamus. A totally different species. Please try an post what alexandrae really looks like.